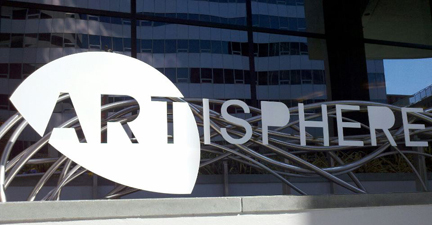 I went on a field trip with my friend to Arlington to visit a place called Artisphere, an urban arts center. The building space it occupies was the old Newseum. The exhibition we went to see was ‘Frida Kahlo: Her Photos.’ Artisphere is the “first and only U.S. venue” to present this exhibit of personal photographs that reveal moments of Frida’s private life. We weren’t allowed to take any photos of the exhibit, so the exterior shot of the sign is all I captured. Afterwards, we took advantage of the beautiful spring-like weather and walked from the art center across the Key Bridge into Georgetown for some lunch. A nice and relaxing way to end the weekend.